Online marketers and SEOs work with large volumes of data every day. You should always make sure you read and interpret the data in a meaningful way. Google Data Studio is a powerful tool that you can use to visualize data from different sources. We will show you what you should pay attention to when using Google Data Studio, and how you can utilize Google Data Studio in the best way for your online marketing activities. Which data is important for my business? Prior to using Google Data Studio, you should set a precise goal for your data analysis. Of course, this basic rule does not only apply to the Data Studio, but also to other web analysis tools such as Google Analytics or Ryte. With the right goal in mind, data compilation becomes more structured and efficient. Ultimately, you are not using the data for the sake of the data itself, but to achieve something with it. So, try to define some data visualization goals based on your marketing strategy. How have my conversion rates developed over the past three months compared to last year across Google AdWords, Facebook and Bing Ads? How did the number of visitors in the last quarter develop in comparison to the previous year? Which of my traffic sources are most efficient? Google Data Studio is a free and convenient tool for generating reports involving multiple data sources. It was first offered in May 2016 as a beta version. Since then, the developers in Mountain View have continually improved the tool over time in response to user feedback. In September 2018, a new version was made available that gives users who have a Google Account the ability to create an unlimited number of reports. In general, Google’s Data Studio is suitable for online marketing advertisers and SEOs who want to create reports for customers or to evaluate their own performance. Ultimately, the tool is always useful when you want to process data from your online marketing activities in an appealing, easy-to-understand and clear manner. Google Data Studio can access data collected by products belonging to the Google corporation. These data links are called “connectors” in Data Studio. Currently, you can merge data from 17 Google connectors. These include Google Analytics, Google Ads and Google Sheets as well as data from the Google Ad Manager, Google Cloud SQL or Google Sheets. 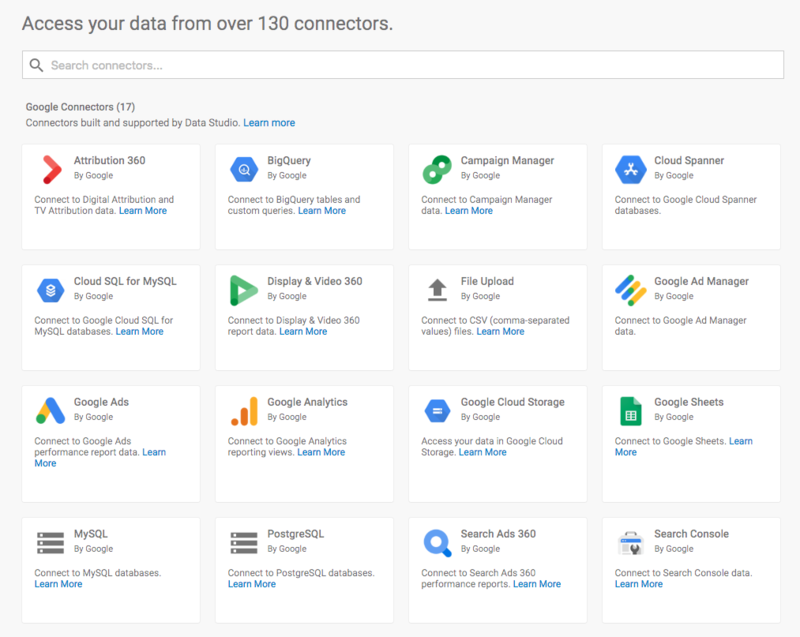 In addition to these standard connectors, third-party providers can also share their data using a Google Apps Script API for processing in Google Data Studio. You can now use 94 so-called “partner connectors”. In total, depending on the software you use, there are over 110 different data sources available to you in the Google Data Studio. For example, you can use the partner connectors to include data from Bing Ads, your Amazon Seller account, Criteo or LinkedIn. You can find an overview of all connectors here. In addition to these data sources, any data can be imported into Data Studio using SQL databases or even .csv files. You can also import data from Ryte into Google Data Studio in this way. This results in countless possible combinations for creating meaningful reports. As mentioned previously, you should not combine data from all possible sources without a clear goal, otherwise transparency and efficiency will be compromised. 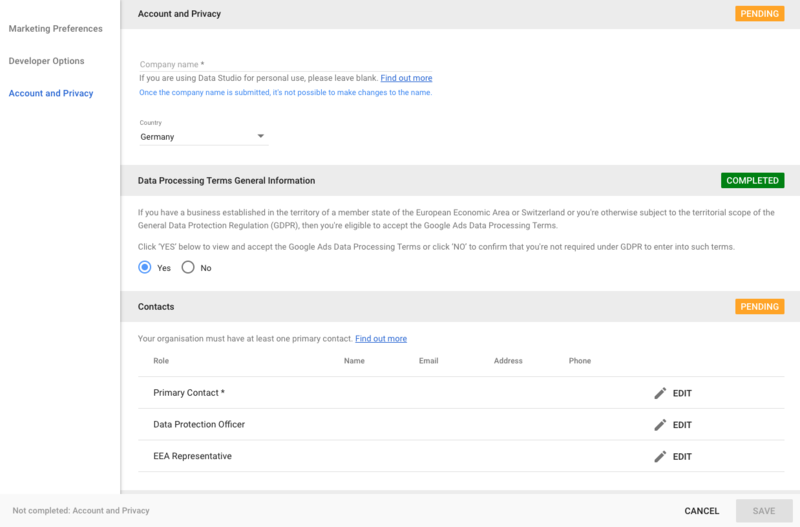 As part of the introduction of the GDPR in Europe, the data protection measures for Google Data Studio were also significantly amended. Therefore, before you process data with the tool, you should first enter all necessary information in the tool and accept the Google Ads data processing conditions. In order to create a report using Google Data Studio, you first need to set up the appropriate connectors. This is the only way you can access the required data. Figure 3: Authorize a Google Analytics connector. As soon as the data is available through the connectors, you can visualize them in the Google Data Studio. There are many display options with the tool. With a few clicks, you can change the contents of your reports as well as modify the way the tables are displayed. This is why it is important to define your goals before using Google Data Studio, otherwise your reports could easily become confusing. You can also customize the design of your reports. This allows you to select the primary and secondary colors, as well as fonts, in the tool. You can also change your layout. In the side menu, for example, format and spacing can be set. Reports are easy to “brand”. You simply insert an image or a text field. All created reports or charts can be shared with other users by clicking on the ”Share” icon. They do not need to have access to the used data sources themselves, but can read your reports directly. If you share your report with others and these users have access to the same data sources that you do, they can customize the shared report as needed. Reports from the Google Data Studio are always interactive, regardless of access rights. For example, the recipients of your reports can change the analysis period by themselves. Google’s Data Studio offers countless possibilities to display data in a clear and perfect way. We have already shown you how you can build your own report using the Google Data Studio. It may take a while until you have created the perfect template for your reports, because of the many options available. However, in most cases you don’t have to reinvent the wheel for your data analysis. Complete marketing templates from the Google Data Studio team have already been uploaded to the “Report Gallery”. In addition, you can access all of the templates published by the community. It is worth visiting the Report Gallery from time to time to look for suitable templates or dashboards. Of course, you can also use them just for inspiration and adapt both the data sources and layouts to meet your requirements. In this practical report, you’ll see all the important data about the users of your Google Analytics-tracked websites. Click on the report and then on the desired data basis. Figure 4: Select suitable data sources for your standard report. The following template is only suitable for e-commerce websites. If you want to use it, make a copy of it first. Figure 5: Copy a template in Google Data Studio. After that, you can choose which data source your report should be “fed” with. Figure 6: Google template for e-commerce sites. Google Analytics can give you valuable insights into how your content is received by users. Therefore, this template is very well suited for all those who are responsible for content production and analysis. Of course, as with all templates, you can delete unnecessary data sources from your report. Otherwise, simply select the desired Analytics property from which the data should originate. Figure 7: Google Data Studio dashboard for content experts. With the Web Analytics dashboard you can combine the most important data from Google Analytics, Google AdWords and the Google Search Console. This gives you a perfect overview of the performance of your web project. To customize the report, copy the template and edit it using your data sources. Figure 8: Link Google Analytics, Google Search Console and Google AdWords to the Google Data Studio. You can use this report to clearly display the key conversion data from your Google AdWords account. This dashboard provides valuable insights that you can use when reporting to your AdWords customers. 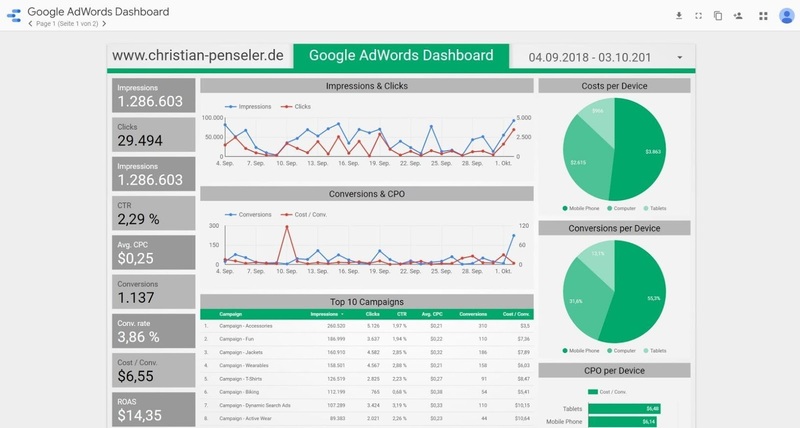 Figure 9: Google AdWords dashboard in the Google Data Studio. Use “pages” for more clarity: You can structure reports across multiple pages. For example, it is possible to export your reports by page to a different device or, when dealing with international websites, to export each page of your report to a different country. Use filters to make your report interactive: you can add a filter function to each of your reports. This allows users to customize the data view according to their needs. Copy fields for multi-page reports: Especially for reports with multiple pages, not having to create the same field every time can be helpful. You can choose to have a field appear in the same place on each page of the entire report. For example, this is useful for footers or headers. With the Google Data Studio, Google provides a very practical tool that you can use for generating individual reports. The tool is very extensive, so it is easy to lose yourself in the myriad of options. This is why we recommend that you start by using standard templates or dashboards created by the community. This allows you to familiarize yourself with the many different functions and gradually make your reports more professional. One more tip: Just experiment with Google Data Studio and see how and which data can be combined. By defining your analysis goal in advance, you have already laid the foundation. All you have to do is follow it! Published on 11/27/2018 by Pauline Mitifiot. Pauline studied history and project management at Aix Marseille University, during which she spent time living in Turkey, Italy and Germany. Pauline then settled in Munich because she could no longer do without her daily pretzel. She has been part of the Ryte team since July 2016, and contributes to the French Ryte Magazine and Wiki.